The great “American Dream”: A four-bedroom two-story in a quiet subdivision, little Johnny and young Sally running around the fenced-in backyard, the 9-5 career downtown and two family-oriented vehicles tucked away in the garage, one of them most likely a sport-utility or crossover of some sort. Sounds perfect, doesn’t it? Well, if this sound like your version of suburban paradise, then GMC thinks its Acadia crossover is the perfect addition to help fill that garage slot. But is this car-based SUV good enough to grace your garage with its presence, or are the competition a better option? 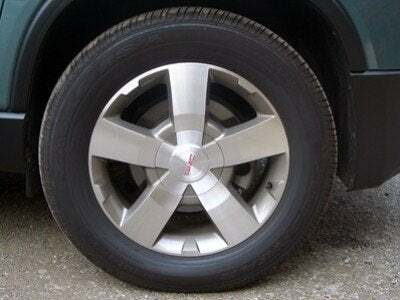 General Motors first introduced the FWD-based Acadia in early 2007 on the newly developed Lambda platform. 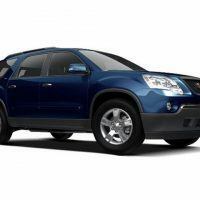 Since its release, the GMC (along with the Buick Enclave, just-released Chevrolet Traverse, and Saturn Outlook copies) are snatched off dealer lots in surprisingly quick fashion. 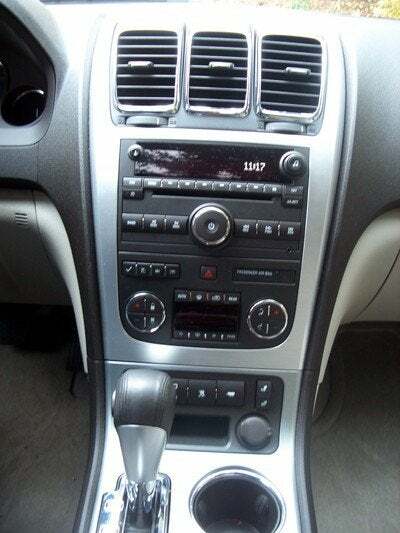 The car received a mountain of positive praise for its smooth ride, improved quality and excellent interior space. However, one constant complaint was the powertrain. Most people felt the 271 horsepower, 3.6 liter V6 was straining to carry almost 5,000 pounds of Lansing, Michigan steel and plastic. 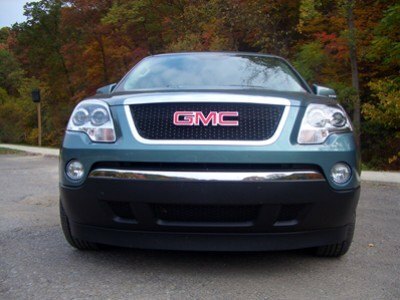 For 2009, GM has addressed this problem with a brand-new engine. The new 3.6 liter is the same one you find in the Cadillac CTS, and it comes with all the techno-goodies as well: variable valve timing, direction injection, two camshafts. What is direct injection, you may ask. Well, in a nutshell, the fuel is squirted directly into the cylinder compared to the intake runner. This means the engine will run more efficiently as well as produce more power when you open up the loud pedal. The results? Thirteen more horses and 5 ft. lb of torque, for a new total of 288 and 256, respectfully. It may seem like an insignificant increase in power to call for a new engine, but drive last year’s model back-to-back with a 2009, and I guarantee you can tell a difference. Pulling onto a busy highway or passing a slow-moving semi on a two-lane road is no longer a death-defying feat. The engine pulls strongly to redline and does not run out of breath towards the top-end of the power band like the older multi-port engine. And it will still pull 4500 lbs. The new engine is still used in tandem with the six-speed automatic gearbox, which is a smooth operator in normal driving conditions. Other than the new engine, nothing much else has changed. Inside, there is a three-tone color scheme inside: titanium leather, black and matching titanium plastic, and brushed aluminum trim. The dashboard layout is standard GM, with a carryover radio bezel and HVAC controls molded into the center stack. 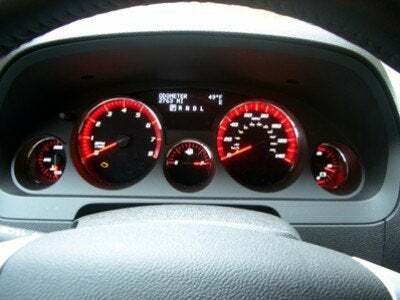 The gauges reside in five separate holes which are stuck deep in the dash and glow a gorgeous red. 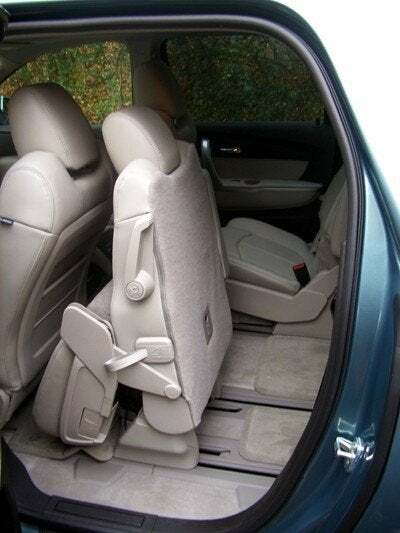 Storage space for all you and your family’s knickknacks is ample, with door pockets all around and a deep dual layer bin in the center console. There are 12 cup holders too, so no one will have to hold their drink in a packed car. 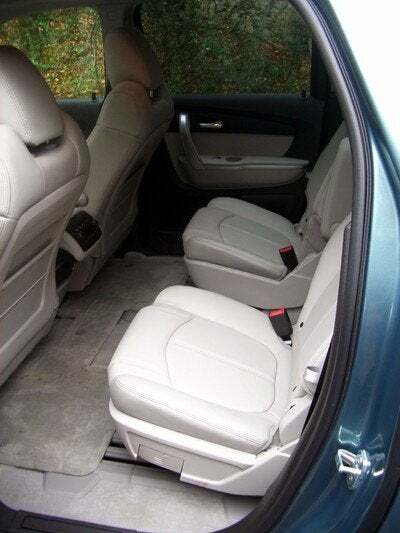 Luggage space offered is more than adequate, with 19.7 cubic feet of groceries or sports bags when the third row in place, and the storage space can stretch to a vast 117 cubic feet when both back rows are in the fold-flat position. Seating comfort in the first row comes with firm, but comfortable leather seating. Access to all controls is equally as good, with an easy reach to most controls. A rather large steering wheel sits in front of the driver, but has useful controls for the cruise control, radio and standard Bluetooth connectivity. Buyers can choose either captain’s chair or a bench for the third row. 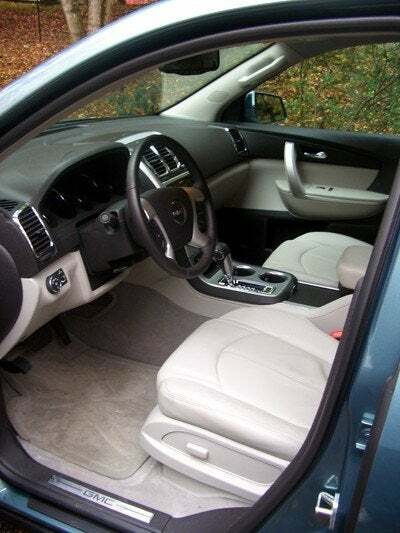 This particular Acadia came with the SLT1 trim level, so this example came with two seats, which were comfortable as the front, but were too low to the floor. This means that most riders will have to look at their knees while going for a ride. The third row is best left to small kids or amputees. One cool feature must be mentioned though. In order to access the third row, one must move the second row seat out of the way. Many companies have their own methods of accomplishing this goal, but the one residing in the GMC is one of the best offered. Called Smart Slide, to access the third row, simply grab the handle and pull. In one deft motion, the seat cushion folds up against the seat back, and then the entire seat slides all the way forward, leaving ample room to maneuver to the back. Very handy for when you arms are full of kids. 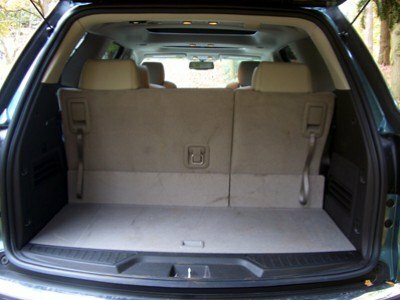 And don’t worry about protecting the little ones, because the Acadia comes chalk full of it. Standard features like front, side and curtain airbags as well as anti-lock brakes and GM’s Stabilitrak are all standard. In addition, the Acadia receives five-stars in both driver and passenger side crash protection and four-stars for rollover protection. 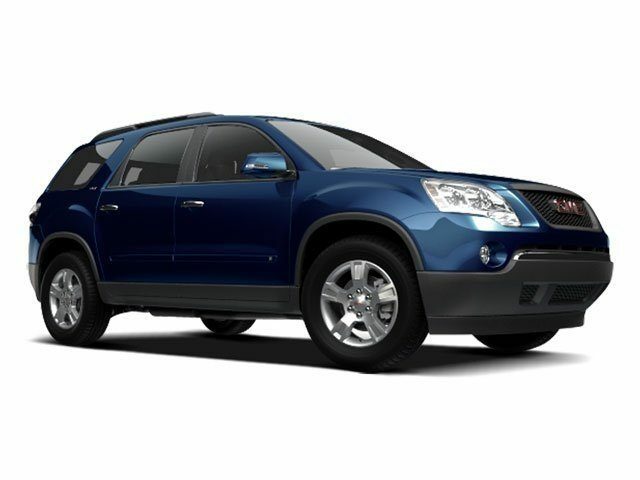 Since the SLT1 is a mid-grade package, the Acadia can be had with some very nice extras, such as the aforementioned leather, three row seating, tri-zone climate and audio controls, Bose stereo with XM radio, power front seating and 18-inch wheels. On this example, there were added bits, such as gorgeous 19-inch wheels, rearview camera with parking sensors, and a Dual Skyskape sunroof, with an electric sunroof in the front and a large piece of fixed glass in the rear. And whether you’re taking the family on vacation or you are going to the grocery store, the Acadia can handle whatever you can throw at it. It has a smooth ride which is impressively quiet, which is shocking considering the 19-inch wheel and tire package. Steering is light, but accurate. 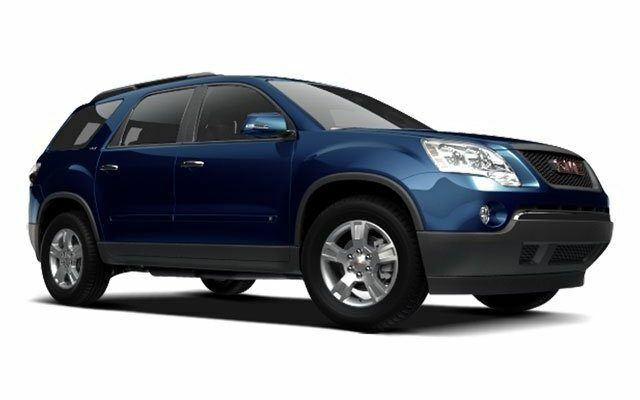 The Acadia’s chassis is well-balanced, with a grippy chassis that will stay flat when zooming around an on-ramp. Brakes are firm and perfect to modulate, but there is too much travel in the pedal itself. But once you get through that vast dead spot, they are very good. Even though this crossover may seem like a sound handler, it’s not. Unfortunately, it suffers from a major obesity problem. As mentioned, this thing weights two-and-a-half tons. That is not light by any means. Added onto that, the Acadia 201 inch long body makes it feel about as small as coal barge. Combine the two, and you will feel every single ounce and every since millimeter when driving it. Even though everything seems positive, outside of a less-than-stellar size problem, there’s one glaring problem with the GMC Acadia. Yes, you guessed it: quality. Let me start off by saying that, yes, GM has improved their quality recently. The materials feel better than if you were to go back a few years into the product line. 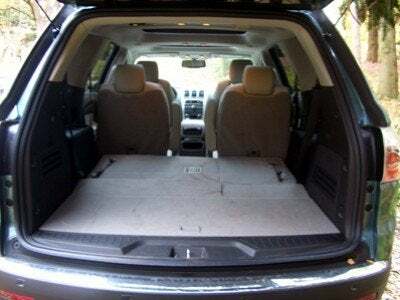 However, the inside of the Acadia is still behind everyone else. The plastics look nice, the aluminum trim which makes up the center stack is very nice, and the leather is Cadillac-supple, but touch anything else, and everything feels cheap. The top of the dash feels paper-thin, the door panels flex and plastics around the foot well area scratched too easily. Then there were the rattles in the headliner, which on a car with less than 3000 miles on it is unacceptable. 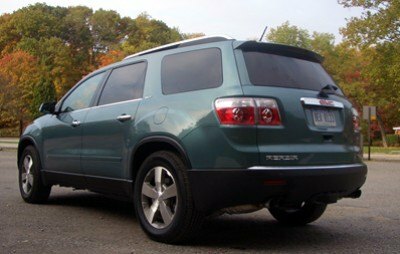 I think the GMC Acadia and its platform duplicates are very good, especially coming from one of the manufacturers in Michigan. GM has a good first step in this incredibly tough group of vehicles. If they want to keep up and make suburbanites, it will need a major material overhaul to make sure they keep one of these in their garage. 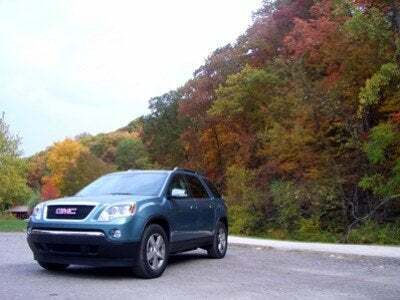 9 Comments on "2009 GMC Acadia SLT-1 Review"
acadia is the best crossover. not just from gm. Its led tail lights are spectacular! 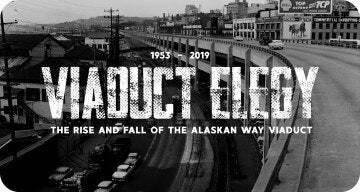 Its all around better than enclave, traverse. its tied with outlook on looks though. overall, its just amazing. 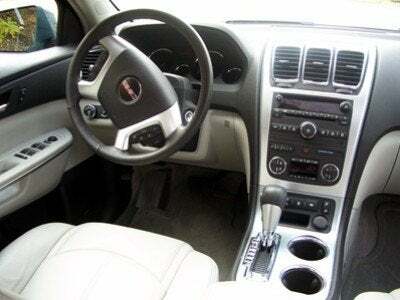 The Acadia is powered by a 3.6L V6 engine paired with a six-speed automatic transmission. Standard amenities include keyless remote entry, hands-free OnStar communication system, tinted glass, heated mirrors, roof rails and a rear spoiler. I own a 2009 SLE, not crazy about the transmission! It shifts abruptly! Does not upshift or downshift with ease. 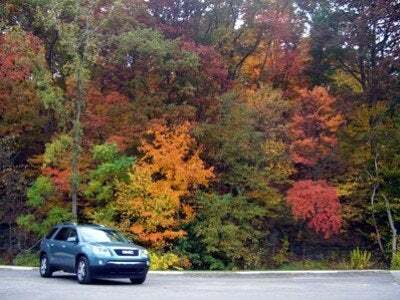 I've allowed multiple people to drive my acadia to experience it's shifting issues and all agreed. Even my salesman and service manager from dealer. Although once hooked up to a diagnostic, nothing reads abnormal. So I'm told "there's nothing more that we can do for you Ma'am." I'm told "it's the way Acadia's are built….with their electronical V6 engine.." Great, thanks for all your help guys! For sale signs in windows as I type.. I suggest you contact the district manager for GM with this complaint. 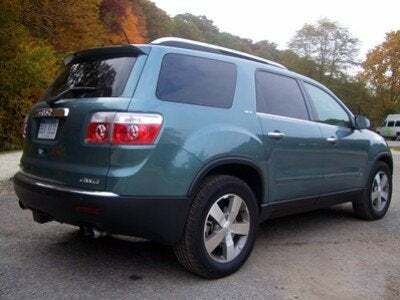 I have an identical 2009 Acadia on which the shifting is so smooth as to be unnoticeable, so you definitely have a lemon transmission. GM doesn't want unhappy customers out there, so don't stop with your dealer (who sounds like a first-class idiot). When confronted with stupidity like this, go up the chain of command until you obtain satisfaction! 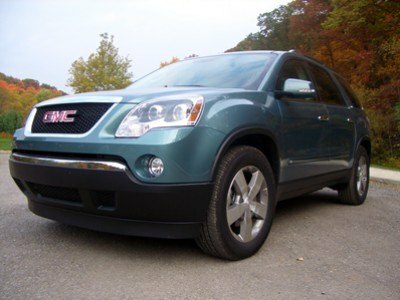 Just bought a 2009 GMC Acadia 2 months ago. City mileage is VERY POOR. I am going to be taking a trip next month so will see how the mileage is on the Interstate. I absolutely love this vehicle inside and out. It has lots of power under the hood, the exterior is impressive and I like the interior except if you are not careful the leather upholstery will scratch and peel off revealing white underneath (ie baby car seats). I touched mine up by dobbing a black majic marker on the white dots. All in all this is one class act vehicle–oh, by the way I have a 2003 VW Bug to drive around town. 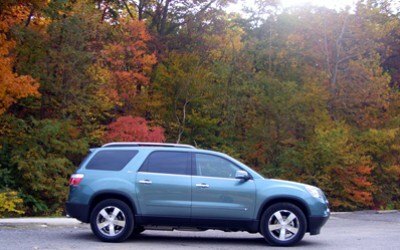 The acadia is a good family vehicle but to me it just isn't appealing.